The Guatemala La Esperanza was carefully roasted for you by Barefoot Coffee Roasters. This fully washed coffee was grown by the various small holder producers in the Antigua region of Guatemala between 1,500 meters above sea level. Enjoy the super balanced and crisp cup with notes of chocolate, toffee, and pleasant acidity. We like this coffee a lot better than the other two that We received. It tastes very smooth and sweet with Caramel and chocolate flavors, not sour and very balanced. I have brewed it in French press. made a great cold brew! Best coffee so far this round! Full of flavor with a smoothness that hides the acidity well. I've really enjoyed this bean, No complaints - it's a good comfort coffee true to its description. really enjoyed the chocolaty notes in this coffee! Coffee consumed Black w/o anything added. Beans were rich in color and smelled very fresh! They were perfectly roasted! When starting to bloom, it seemed as though there was Crema above the crust! I've never seen this in any other coffee before, usually just the co2 release when starting the pour. This coffee bloomed WONDERFULLY at 45 sec, and the rich "Crema" remained through the entire brewing process. The brewed coffee is rich in color and smells earthy yet sweet! This coffee was smooth when it first hit my pallet, but quickly released into this bite! Like chocolate with chilis! It was great! It has a light mouth feel and finished rather quickly. 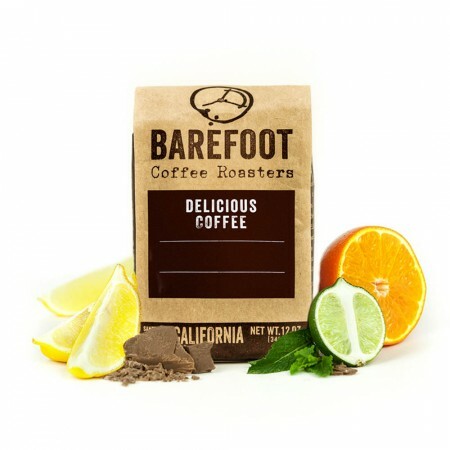 I really enjoyed this one by BAREFOOT! This coffee was smooth when it first hit my pallet, but quickly released into a bite likened to chocolate with chilis! It was great! This is a really tasty coffee with a nice smooth finish. Very similar to diner coffee, which is not bad at all, but missing sharper accents Im realizing I enjoy. Very "low-pitch" flavor if that makes sense. Overall it's well balanced but lacks anything truly remarkable. Its not bitter, maybe slightly acidic but not overly so. The beans didn't seem lighter than some other coffee's I've enjoyed, and the aroma was great from the bag, but once brewed, those flavors didn't seem to translate into the cup. Maybe something slightly more bitter would be better. It didn't seem like the roast was an issue, as we've brewed beans that were more grey than brown and they were amazing. The Peru Huabal was more in the right direction. I really enjoyed this coffee. The bean color was in line with what I tend to enjoy most. It had great smell, both before and after brewing. It had a rich flavor without having a burned or bitter aftertaste. I did enjoy this coffee, however, the bean was a bit weak, I had to use more beans that usual to really get the flavor,-- I tried a few different methods, fine and coarse, kemex, press, and aero-press, and I was not impress with any of them,... good but not great. -- maybe next batch I get something stronger with more body to it. Nice opening acidity. Smooth and pleasant notes of chocolate. Great stuff. The La Esperanza is a very balanced cup of coffee. It has a very full, smooth mouth-feel. There is a nuttiness at the back of the palate and a mild bit of bitter/acid at the front, but not too much. All in all a very good cup of coffee. The chocolate notes made this coffee soo delicious to pair with dessert. It didn't quite blow my mind, but it was solid and I enjoyed it. Thick mouthfeel, almost sludgy. Earthy tones, but a little overly bitter. Mild unpleasant acidity without any redeeming citrus notes. Either the bitterness or acidity almost leaves the tip of the tongue a little bit numb. good coffee but a bit too fruity. Not my preferred choice. MAKES A GOOD CUP OF COFFEE. Little too chocolatey for my taste. It's good but not good as the colombia la varniza. Absolutely delicious, perfect chocolate/acid amounts and very smooth cup of coffee! Chemex brewed.